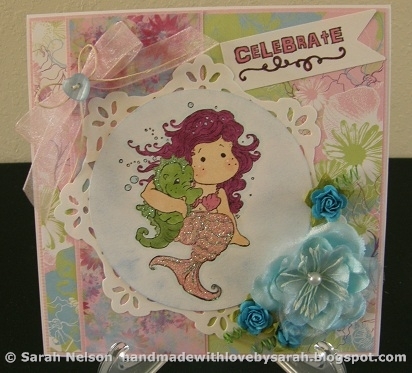 Handmade with Love by Sarah: Celebrate! I have a Magnolia birthday card to share that I made for several challenges. I had so much fun coloring Pearl Tilda, but I am really regretting not buying the accompanying clam shell from this collection! So, having decided to use Pearl Tilda, I thought I would go a little crazy with the coloring of my mermaid (for me at least!). I am working on using up some of my paper pads, and today's target is Basic Grey "Euphoria." The dp that is the background on this card was kind of an oddball to me. I love the pink, blue, and green, but the green flowers and offset outlining were fighting anything I've ever tried as a layout. My new motto? Don't fight the "difficult" dps, bury them in the background! I did just that, and I think it works pretty well. Here's Pearl Tilda with her wild raspberry hair! I had to angle the card slightly to get the camera to focus. It was really fighting to focus with the glare from her glittery tail! Tilda is colored with Copics, and then I sponged around her to soften it a little bit. I was struggling to find a birthday sentiment that would fit in the remaining space, but thankfully I found this one from Verve that was just right. It's amazing how many of my birthday sentiments were just a little bit too big! Stamps: Magnolia "Pearl Tilda" and sentiment from Verve "Birthday Bash"
Papers: White, dps from Basic Grey "Euphoria"
What a cute card! Love those elements and the layout! Thanks so much for joining us at MDUC and at The Sketchy Challenge this week! Love the color you chose for her hair, love the very soft colored background! Oh Tilda looks great with pink hair and all that glitter! Very sweet card. Thanks for joining the Sketchy Girls!